Berghaus is marketing a limited edition of of it’s Challenge 8000 jacket, a hard shell Gore-Tex XCR jacket designed by British Mountaineer Alan Hinkes. Hinkes reached the summit of Kangchenjunga on 30th May 2005 becoming the first Briton to climb all the world’s fourteen 8000 metre summits. It’s taken 18 years and 28 expeditions and Alan describes his final summit as one of the hardest and most dangerous climbs of his life. 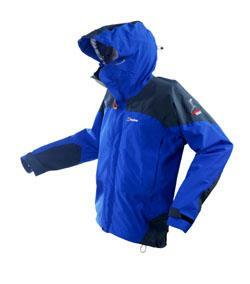 Berghaus says the jacket is an exclusive new design, manufactured from GORE-TEX® XCR® and has numerous features specified by Alan unique to the garment.